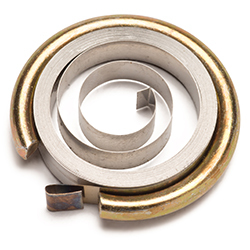 A power spring’s natural tendency to expand imparts a moment to either the arbor or case, producing usable torque. The torque generated is cumulative so that the torque increases as the spring is wound tighter and decreases as it unwinds. Power springs, also known as clock springs, can be assembled into a customer’s housing for immediate assembly or supplied with a retaining ring for transferring the spring to a customer’s housing. Torque and the total number of turns are the most important output requirements in a power spring design. The performance of a power spring is defined by the dimensions of the spring material (thickness, width and length) and the space available (housing and arbor diameters). Power springs from Hunter Spring are made from 301 High Yield Stainless Steel. Other materials including Elgiloy, Inconel, or high-carbon steel can be used upon request for custom applications. Hunter spring does not stock power springs. Springs are designed for customer specific applications only. Use the design worksheet to specify your requirements and allow our Application Engineers to provide you with a design to meet your needs.